Real World Example: Creating a Journal Entry App with Core Data in Swift Part 1. In this article we will be using the basic foundations of Core Data and how to use it in a real world iOS example by creating a simple journal entry application that utilizes Core Data to save, retrieve and delete your entries. It’s a framework just like UIKit provides UIButtons, UILabels, UIViews Core Data provides a way to manage data/models. With Core Data you can save, retrieve, and delete data from disk. Let me define you some terms so when we get to them you won’t be so confused. Entities — Think of this as people. Attributes — Think of this as all the information about people. Like name, email, age, birthday, location etc. If you don’t see this, you didn’t check the box “Use Core Data”. We’re going to end up creating something like this, where we’ll be able to add new entries to our list and delete any entries we don’t want anymore. For this example I quickly threw this up in storyboard. I won’t be going over how to implement the user interface and all the IBOutlets. As always though I will have the full project on my GitHub. Feel free to use it as a reference or even download it and screw around with the files to see what else you can add to it. Wondering what that .xcdatamodelId is? Open the file ending in .xcdatamodelId . This is where we can create Entities, and add Attributes to them. On the bottom left click on Add Entity . Then name the Entity (click once on the text) whatever you’d like. I named mine Item. Now click on that Entity, and on the bottom right click Add Attribute. Give the attribute a name, I simply named mine name with type String. Thinking back I should've called it entry . Though you can call it whatever you want, doesn’t really matter. We need to save the text that the user enters in the UITextView. Open the file for your ViewController file, I called mine addItemViewController. Before you do this, make sure your UI objects are connected. To save the data typed into the UITextView, write this into your button’s action block. This may seem a bit long and complicated at first but it’s quite simple. It’s a basic if else statement. The first part is checking if the itemEntryTextView(UITextView) is empty or if it’s equal to Type anything… and if so, then alert the user. Reason being I wanted some type of placeholder. UITextViews don’t have placeholders so I gave it some default text and then put it to some light grey color in storyboard. Later I’ll show you how to change the text color to black once a user starts typing. The second part is accessing the properties in the AppDelegate and then using it to save the data. If you take a look in your AppDelegate, there’s some code there by default that Xcode provides when we checked yes to using Core Data. Then last line is to dismiss the view. We will be displaying the saved data in our UITableViewController. I named mine DisplayTableViewController. First let’s get access to the properties in AppDelegate. We also will be storing the fetched data into an array. Create a function that will be called to grab the data. Instead of calling this function in the viewDidLoad, we can call this in the viewWillAppear so that every time the view is shown, the data will be up to date. This is important when we dismiss our addItemViewController . If you’ve ever set up a UITableView before you know it’s pretty straightforward. I put it in an extension just to make the code for the UITableView separate. We’re basically grabbing each value from the array and setting it as the cell’s text. In numberOfRows we need to return the count of the array. Run this in simulator and we should now have a working application where we can save data and display it in a table. 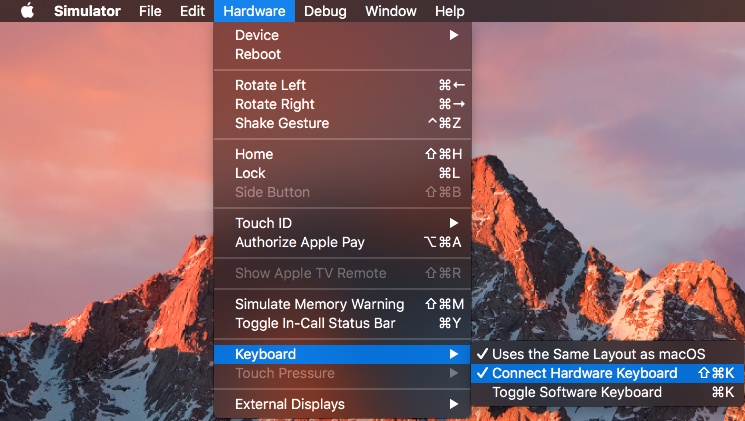 Make sure you toggle have Connect Hardware Keyboard checked in the simulator so that you can access the button at the bottom of the screen. In Part 2 I will show you how to dismiss the keyboard upon pressing return on the keyboard. When we don’t like an entry, delete the data with slide to delete. Have dynamic cell heights, so no text would be cut off. Make the newest task at the top. We’ll be adding the date & time stamp to each post. For fun I’ll also show you how to use custom colors for buttons etc using RGB values. Look forward for you to read part 2! iOS / Node.js Developer / Available for hire.